1. In a medium bowl, whisk together flour, baking soda, and salt. 2. In a large bowl, using an electric blender, cream together butter, sugar, brown sugar, and vanilla until blended. Then beat in one egg at a time. 4. In a large glass measuring cup, microwave the remaining cup of chocolate chips for 30 seconds. Stir vigorously using a fork then continue microwaving for 15 second increments stirring in between until chocolate is completely melted and smooth. For more liquidy chocolate lava, stir warm heavy whipping cream into the melted chocolate (optional). 5. 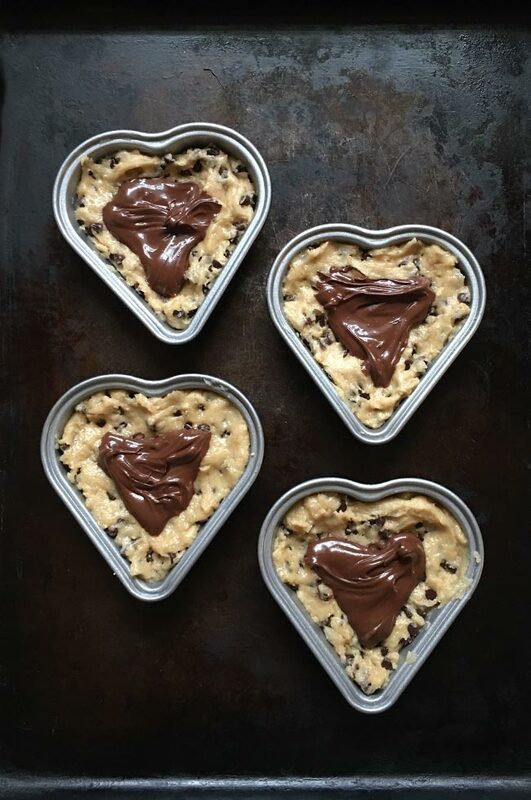 Grease heart-shaped pans with butter, then fill half way up with cookie dough and lightly press into the cookie pan to cover the bottom. Then spoon 2 tbsp of melted chocolate into the center of cookie. Finally place a layer of cookie dough on top and gently press into the pan on the side to seal the chocolate lava in place. 6. Bake at 350˚ for 20-22 minutes or until the top of cookie is just set. Edges will be light golden brown. 7. Let cool for just a few minutes then gently lift them onto a place, top with vanilla ice cream and serve while they are still warm! It’s easy to make chocolate chip lava cookies at home. 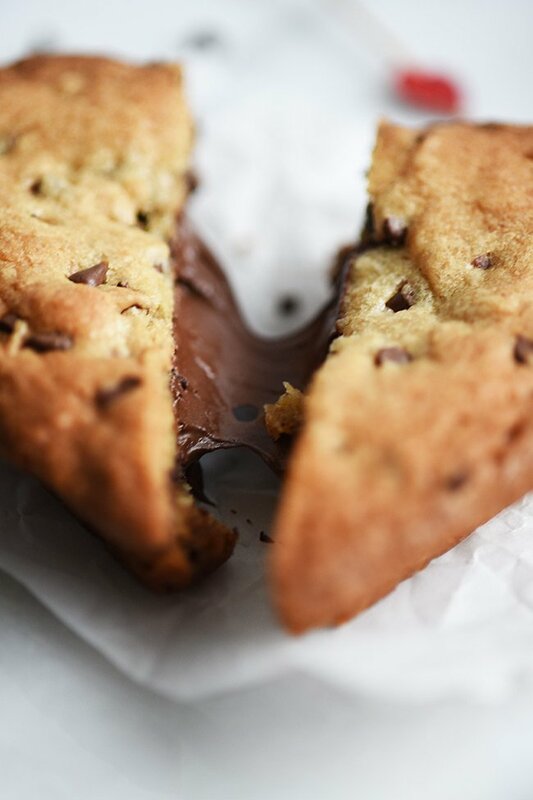 These cookies are so delicious with a gooey molten chocolate lava center! Luckily they’re also super easy to make and just as good as the ones you used to be able to get at Red Lobster. 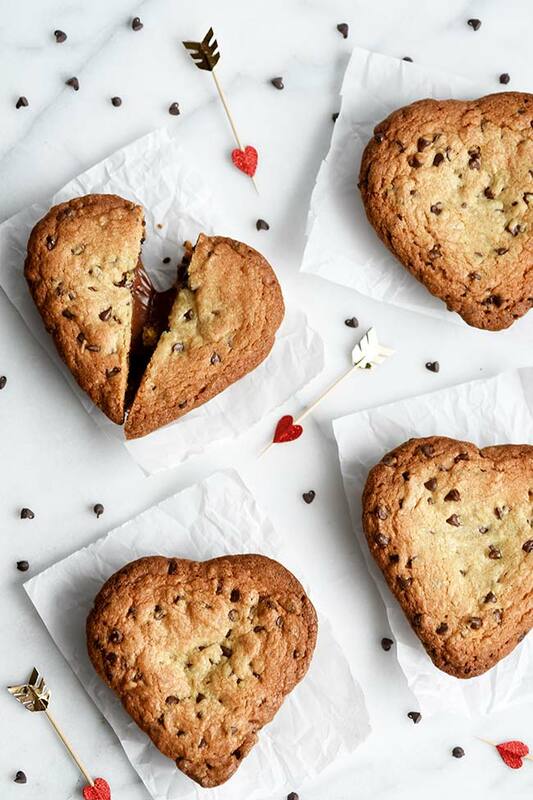 It was a sad day when Red Lobster discontinued their chocolate chip lava cookie! The kids and I often end up at Red Lobster when dad’s working late or when we have to run errands in the evening. One of our favorite parts about eating there, aside from the lobster of course, is the molten lava cookie dessert. Sadly though, they took it off the menu. My son literally cried when he found out which made me want to laugh and cry myself at the same time. See, both my kids work very hard and do well in school and with their activities. We like to celebrate their hard work and reward them with little treats or special trips here and there. The day we found out about the lava cookie being discontinued, was a little bit of a rough day for a variety of reasons, and so I think getting the news that Red Lobster no longer serves lava cookies was just the straw that broke the camel’s back. Tears. Sadness. Shock. Outrage. How could they take it off the menu? Didn’t they know that’s our favorite dessert? So many emotions for a little guys who’s six. As any mom would do, I decide to take matters into my own hands. That’s pretty much how this lava cookie recipe came to be. Heart-shaped because Valentine’s is coming up and well, the with the whole food blog thing, you can’t really get away with just making round cookies. By the way, these are the heart-shaped cookie pans I used. I bought a total of four and baked two separate batches, reusing the pans once, for a total of eight giant cookies! This sized pan make a 4″ deep-dish style cookie. 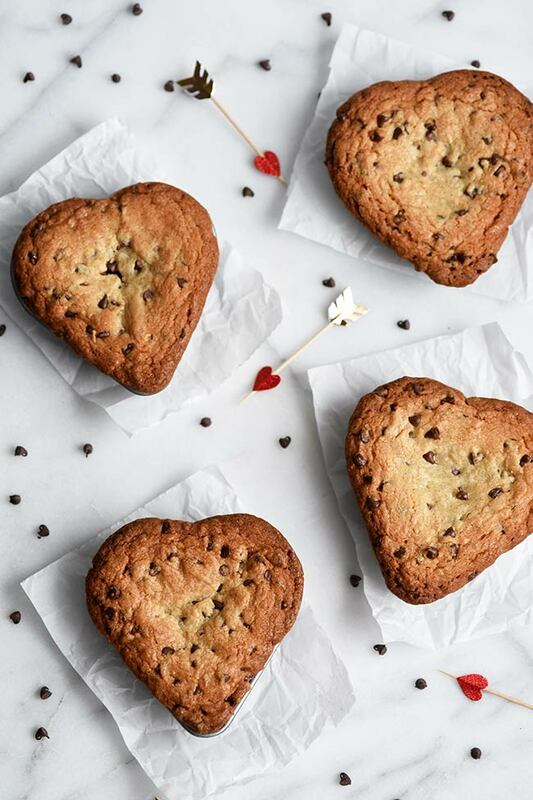 Perfect for sharing and that’s kind of sweet don’t ya think? 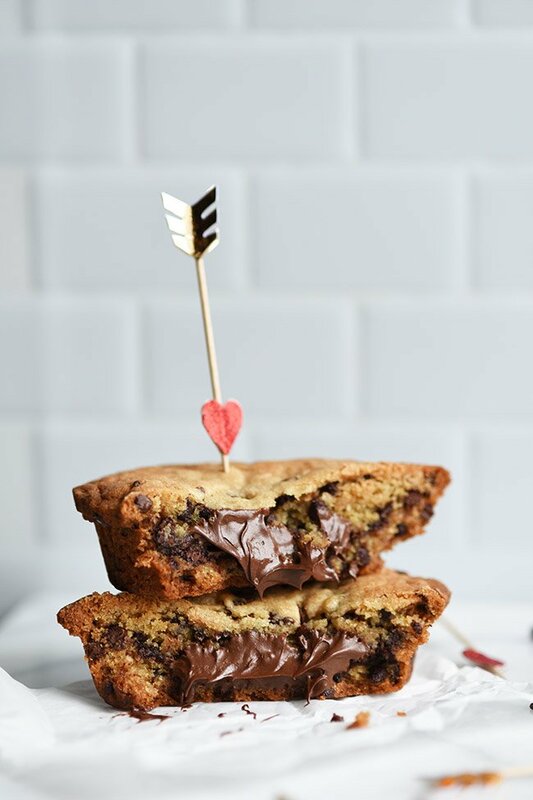 So, whether you’re dating and enjoying romance at its finest, managing a family with your better half, or spending Valentine’s day with friends, I think you’re going to want to find a way to work these warm, melty, chocolate chip lava cookies into your plans! Top with ice cream for the ultimate Valentine’s Day treat to yourself. Don’t feel bad about indulging every now and then. Everything in moderation, right? But if you’re feeling about your sweet tooth, here are a few ways to make your cookies healthier and still taste delicious: Use whole wheat flour (I use half whole wheat/ half white), substitute honey for some or all of the sugar, substitute apple sauce for some or all of the sugar, use dark chocolate chips, use fewer chocolate chips (use mini chocolate chips then! ), use egg whites only, add a banana or 2 tbsp of vegetable purée to the batter. Top with a low-calorie ice cream like Halo Top. There you have it. Guilt-free happiness! 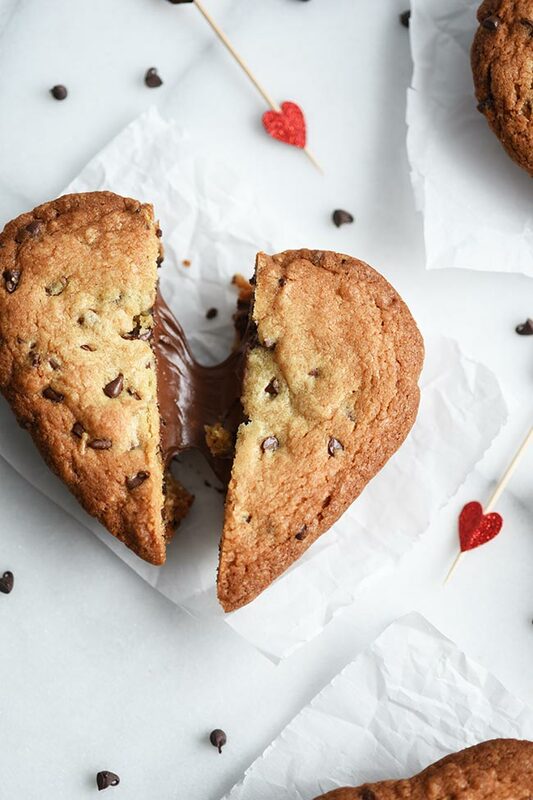 These heart-shaped chocolate chip lava cookies were featured on South Your Mouth!